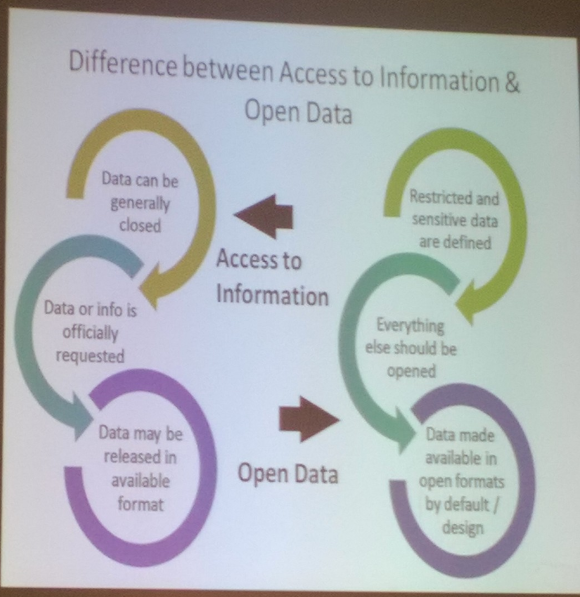 Although Open Data is around since several years in other countries and has been initiated in Mauritius already back in 2012, it is only this year that there seems to be more momentum towards an Open Data initiative. Back in May 2015 I was kindly contacted by Alla Morrison, Program Officer at the World Bank, in regards of showing genuine interest in open government data for members of the Mauritius Software Craftsmanship Community (MSCC). As founder of a local IT community and representative of more than 250 software craftsmen I was positively surprised by this, and the message was circulated immediately. During the second week of June, the Open Data team of the World Bank held several public sessions. Actually, I managed to attend two sessions relevant for developers. 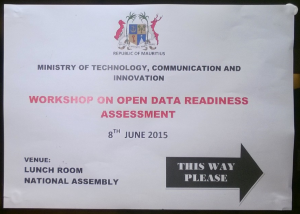 The first event was conducted at the Prime Ministers Office in Port Louis and focused mainly on the ideas, concepts and benefits of Open Data in general. The given use cases and success stories around Open Data were impressive, and it was very interesting to see that solid solutions can be provided by anyone interested to solve a specific problem. During the second get-together, which was more like a workshop, the team wanted to know exactly what kind of open government data and datasets would be of interest for IT folks here on the island. Based on our requests and the talks to the various ministries in Mauritius the team at the World Bank conducted their Open Data Readiness Assessment (ODRA). Fast-forward to end of October, the Open Data team of the World Bank completed their assessment, and members of the MSCC and other organisations were again invited to receive information about the findings and the suggestions first-hand. This time the event was held at the Rajiv Gandhi Science Centre in Bell Village, and surprisingly there were fewer IT people this time. Nonetheless, it felt a bit like a press conference and taking notes as well as pictures during the various presentation had a touch of journalism... Even though I'm quite late on blogging about the topics I got a lot of answers to my questions and the general outcome of the assessment for Mauritius is positive. Surely, there are areas of improvement but overall it looks very promising for us developers to get our hands on open government data soon. "I started with the preparations of the Developers Conference 2016 - https://2016.mscc.mu/ - recently, and I'd like to see whether it would be possible to have access to any datasets of Open Data in April/May next year in order to schedule a hackathon or app challenge during the conference days." And the signs within the government of Mauritius are looking good based on the findings of the World Bank and seeing the increased commitment of the Ministry of Technology, Communication and Innovation (MTCI) makes room for a solid corporation and platform of exchange. 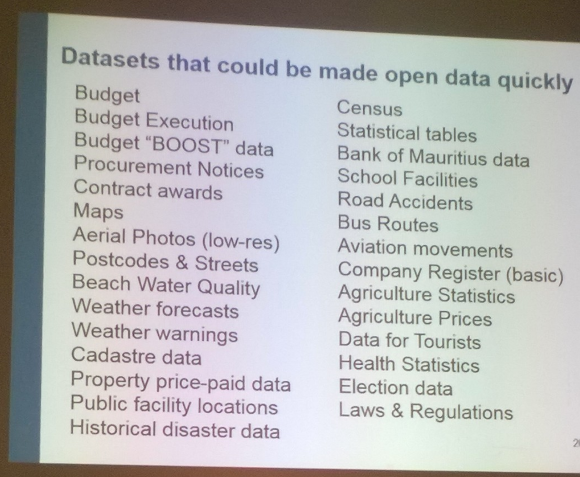 Currently, there are 15 data-sets of Open Data already available from the Mauritian Government in a machine-readable format and properly licensed. An Open Data committee will be in place soon. Various activities to provide and promote Open Data are already planned. In regards to provide access to open government data the World Bank has implemented a 5* rating of Open Data Formats. The Mauritian Government is on a firm way to a 3* rating as some datasets are already available in machine-readable, neutral open formats: CSV, XML, JSON, etc. First, publish "as-is" and then engage with the dataset users in order to improve the quality of information and optional the format(s) over time. Later on, adapt international-recognised data exchange formats based on the domain of information. The team of the World Bank also reported about GDP improvements in other countries between 0.4% and up to 4% per annum by giving people access to Open Data. Concerns based on the activities of DPO since 2004 but no Freedom of Information (FOI) act. No clear information on policies and licensing of data. Cost of printed data and no clear handling of data release. Lack of clear guidance by the government. Over 300 people have requests to develop apps using Open Data. Strong expressed data demand. ;-) Difficult to get access to Open Data from the government, ministries and agencies. Lack of engagement between the various entities. Improved interaction and active engagement by the ministries towards the user groups. Although there are strategy plans to include Open Data there is no concrete, specific funding allocation of money for Open Data in place yet. The Smart Mauritius budget should cover those aspects and the government should consider to move towards using open Source Software. Even though there is a technology infrastructure and high mobile penetration but with high broadband tariffs and ICT skills not meeting the market needs the findings have some reduction. Working towards an Open Data Portal could / should be based on leadership by the MTCI; each ministry should opt for an "implementation cell" working closely with a Chief Data Officer (CDO) and the users of Open Data. The development of detailed policies "open by default" and exceptions, licensing, changes to charges and schedules is inevitable. Clear strategies for audience growth and users engagement are recommended within a short period. Also, the assessment suggests a release of so-called "quick win" datasets onto the existing portal early and the stimulation of hackathons or app challenges organised together with local user groups. Those datasets could be ready in a couple of months and usable for any kind of coding challenges and hackathons. Crossing fingers that it will be. Of course, there are more datasets of interest and it will be our responsibility to ask for such information in a healthy dialog with the corresponding public bodies, mainly the Ministry of TCI. The findings of the ODRA suggests to the government that any kind of data should be "Open by default" including clear definition of restrictions to restricted and sensitive data. Obviously, personalised information have to be anonymised by the ministries prior to grant general access. The necessary competence does already exist within the Ministry of TCI according to the commitee of the World Bank. Additional training among ministries could be conducted and a general guideline for all institutions could be defined, too. Get free access to data, be able to share it freely, just give proper attribution of the source of the dataset. Existing data is to be included in the Open Data initiative even though it might have been "published" previously under closed data formats or inconvenient licensing. Sounds pretty good actually. Let your users become your advocates... clear recommendation by the World Bank towards the Mauritian Government to provide open data and datasets in the right format(s) and to clarify the various demands by the private sector Strong encouragement towards hackathons and pro-active advertisement/notification of the OD portal and activities on OD datasets. What about "Code for Mauritius"? Idea for a new community around Open Data? The findings of the readiness assessment of the World Bank were informative but brief. The full report is with the government and will be presented to the Cabinet during the next couple of weeks. Hopefully it will be published publicly in the near future. As for the MSCC, I had several conversations with key persons at the Ministry of TCI and the National Computer Board about ways of how Open Government Data could be helpful for future activities of the MSCC and how we can improve the dialog with public bodies in regards of more transparency and nourishment of local IT talent. The samples of success story from other countries were really inspiring and I'm very confident that similar results can be produced here in Mauritius. Given that data-sets will be available for free and under the right license anything is possible. Only by looking at the table of content I knew that this is going to be a fun read. The book is actually structured like a set of full-day classes or better said a training workshop for beginners in Swift. It starts with the basic elements of Swift, then covers code workflow and finishes of with more advanced topics like closures and error handling.